One Rose Parade watcher's notebook. I love a good parade and the Rose Parade is most certainly the best parade of them all, but this year was serious disappointment. What idiot picked Paula Dean as the Grand Marshal. First of all I had never heard of her and once I looked u p who the heck she is, I was sorry I had wasted my time. This is the friggen' Rose Parade for god's sake and they pick someone from an outer cable channel? Past marshals included Bill Cosby, Danny Kaye, Walt Disney...she clearly was not in that class. When the commentator said, that the President of the Tournament of Roses gets to pick the grand marshal we immediately suggested that it be managed by a committee in the future. There are apparently hills quite close to Pasadena! Very interesting to actually see them! What's with a swimming pool that can only be seen from the blimp? From my gutter-side seat (my favorite way to watch the Rose Parade) all I would have been able to see was the top of the dog's head and probably be splashed with the water for my trouble. Watched ABC for the first time. We had to record this year and I couldn't find the KTLA crew on our Bay Area stations. They did some things well, like religiously showing close ups and video from the "making of the floats" and they actually let the bands play, but the ESPN crew of Hannah Storm plus someone else was the wrong choice for a parade. This is not a sporting event. What a horrible theme: "Building Dreams, Memories & Friendships." Apparently this theme applies to everything in this universe and thus I recommend that it's time to do away with themes. I missed the Pac 10 presence in the parade. Would have loved to see the Stanford band negotiate "the turn." ABC has a huge need for commercials because after interviewing the Lutherans about their float, they never bothered to show the float they lovingly built. I heard from someone else that the best float was the Cirque du Soleil float which we never saw. 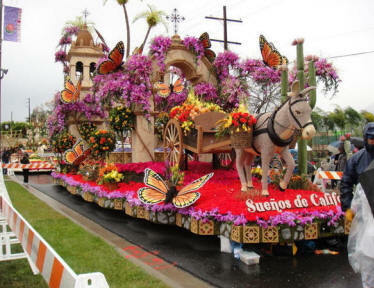 Yes, the Rose Parade is getting too commercial. It's not quite Macy's, but when the three little pigs skip the stone house for a Quickrete concrete house, I have a problem. I'll be there for 2012 but I'm looking forward to a step back in time.